Vauxhall’s Grandland X is one of the boldest SUVs available on the market, as well as one of the most stylish. Packing plenty of advanced technology, luxury, practicality and power, the Grandland X offers amazing value for its price. Its adventurous nature is best reflected by its ruggedness and raised stance. Aerodynamics are a priority, with elegant lines and musuclar curves being a perfect example of Vauxhall’s unique approach to vehicle exterior design. Designed for comfort, the interior of the Grandland X mirrors the unmistakeable style of the exterior and ensures that everyone will enjoy each mile thanks to its plush materials and ergonomic seats. Practical as well, the rear seats of the Grandland X are foldable and allow for the boot space to be expanded to up to 1,652 litres. Frugal yet performant diesel and petrol units are available, with an output of 120 and 130PS respectively. Choose the 1.2-litre petrol engine and you will get 130PS and 230Nm to play with, thanks to its turbocharger. Fuel efficiency figures can go up to 55 mpg, with carbon emissions of only 117 g/km. The 1.6-litre diesel, on the other hand, allows for a more frugal drive, with up to 70 mpg and emissions of only 104 g/km. Equipped with the latest IntelliLink infotainment system, the Vauxhall Grandland X allows for the ultimate in media entertainment, allowing you to connect your phone and stream your favourite music, as well as stay on top your social life. Combine that with wireless phone charging, a premium Denon sound system and OnStar and you have everything you need. The Grandland X comes equipped with state-of-the-art safety technology, such as traffic sign recognition, lane departure warning, forward collision warning and automatic emergency braking. These features are in addition to the standard comprehensive set of airbags and have helped the Grandland X secure a five-star Euro NCAP rating. 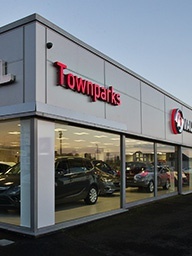 Get in touch with Townparks Vauxhall in Northern Ireland today to book your test drive and discover the Vauxhall Grandland X. You can phone us at the phone number displayed or fill in the enquiry form and a team member will contact you shortly.